Back in Dublin today, and an unexpected ticket for Bruce Springsteen meant I left home without my camera. 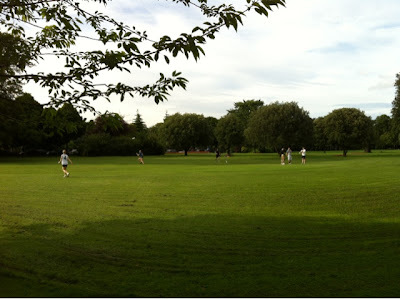 A stunning evening in Dublin, and this was the scene in Herbert Park at seven pm, as rendered on camera phone. A short four hours later and the heavens had opened,; the rain has returned. It was nice while it lasted.